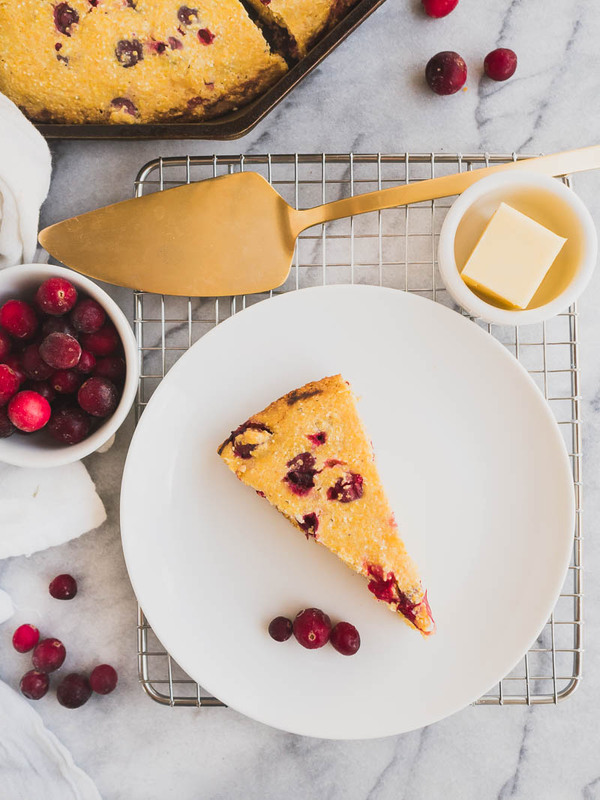 Here ya go, just a week before Thanksgiving — CRANBERRY CORNBREAD! I made this last month and figured it’d be an awesome alternative side dish/bread option for a Thanksgiving dinner. Or, any dinner for that matter! Let’s talk a minute about this cornbread: this is not a cupcake. You know what I mean? Some cornbreads are so soft and fluffy and sweet and literally remind me of a cupcake! This is not that: this is gritty, you might even *gasp* call it a little dry. Let me introduce you to my good friend BUTTER. I had pretty strong feelings going into developing this recipe — I wanted to use cornmeal. I didn’t want this to be 90% flour and 10% cornmeal… that doesn’t sound like cornbread to me. I wanted to cook this more traditionally, too: in a flaming hot skillet with butter melted in it so that the edges of this cornbread crackle and sizzle and get ALL sorts of toasty. Another strong feeling? FRESH cranberries. 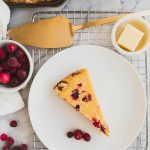 I’ve harped on this over the years (this oatmeal, these scones, these cookies), and will continue to do so: FRESH CRANBERRIES ROCK MY WORLD. Seriously, they are so good. They deliver a tart, juicy punch that just is not the same as a dried cranberry. Everybody clear on this recipe? If you’re looking for a sweet “corn” cupcake: look somewhere else. Sorry to be blunt, but ain’t nobody got time for that here. Have a LOVELY week! I’ll be back on Wednesday with a tasty vegan bowl for y’all! 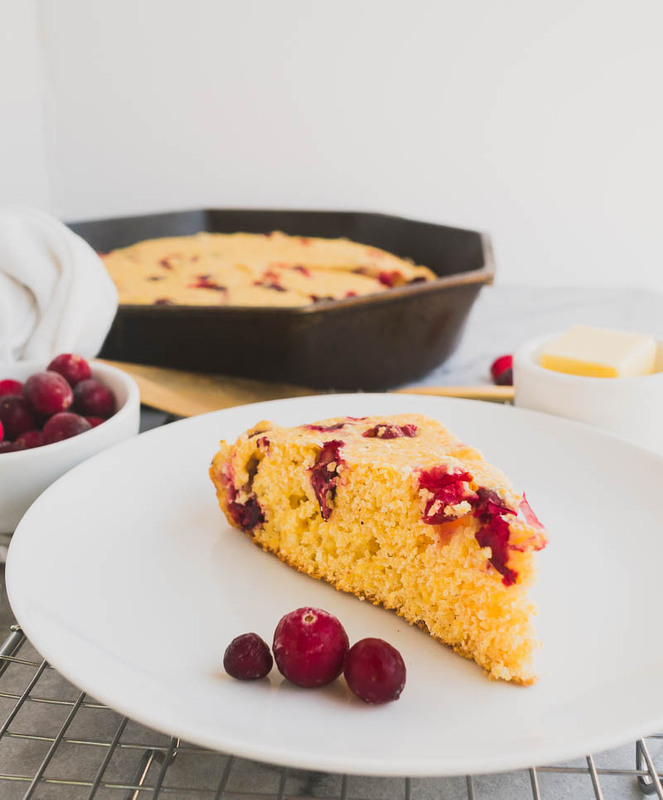 This cranberry cornbread is gritty, not soft and sweet like a cupcake, and cooked in a more traditional method: a hot skillet with melted butter. Combine the cornmeal, flour, salt, sugar, baking soda, and baking powder in a bowl. Whisk to combine, then add the cranberries. Whisk together the buttermilk and egg, then pour into the dry ingredients and mix until combined. Heat a 10″ cast iron skillet on the stove until very hot, then melt the butter in it. 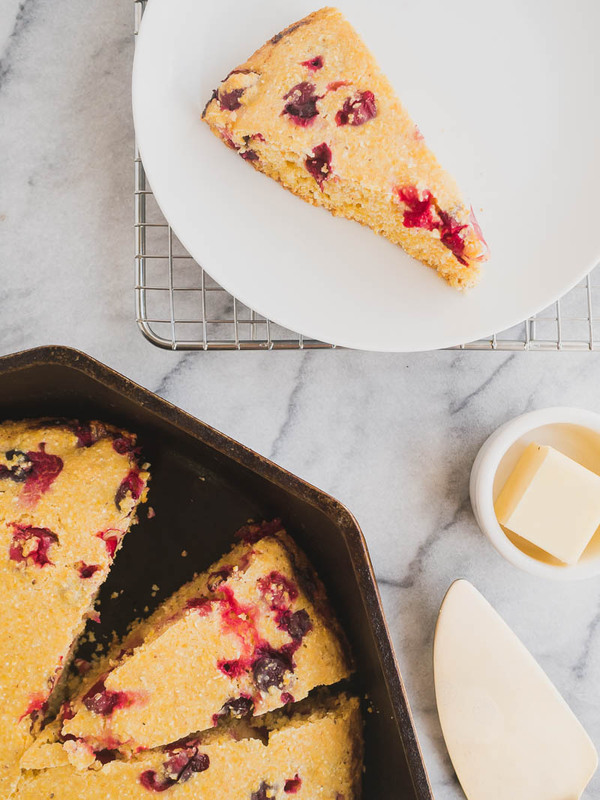 When the butter is melted, pour the batter into the skillet, put the skillet in the oven. Bake for 25-30 minutes, or until the center is set and a toothpick comes out clean. I used course ground cornmeal, but would suggest you use medium, or a combination. 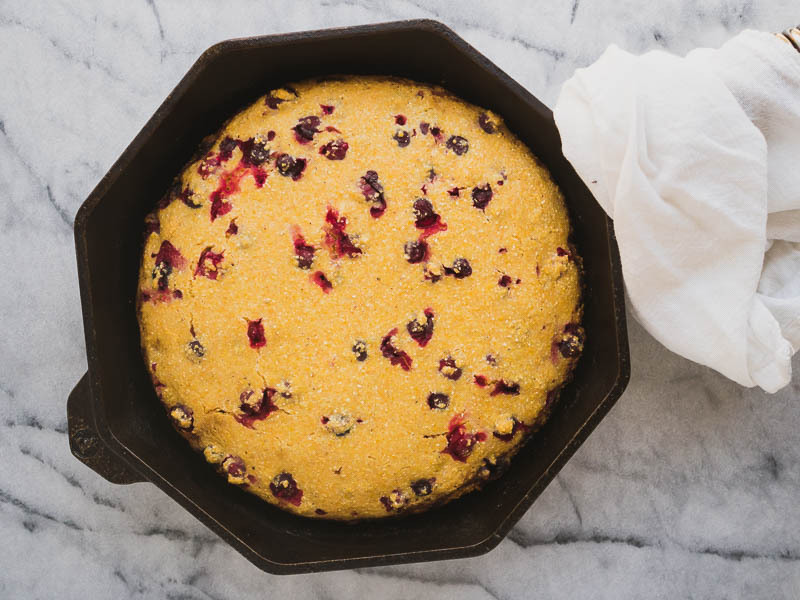 I love that you put cranberries in your cornbread. That sounds absolutely delicious!!. Regards Jacklyn.